Not much time to blog (or knit or felt) this week. I really can't top my last post, so I've been reluctant to post at all. However, it's such fun to get packages in the mail that I thought I'd share. The item on the left is the new driveband for my spinning wheel, which means that I really really really might get it up and spinning again soon. (The more I blog about it, the more committed I feel.) 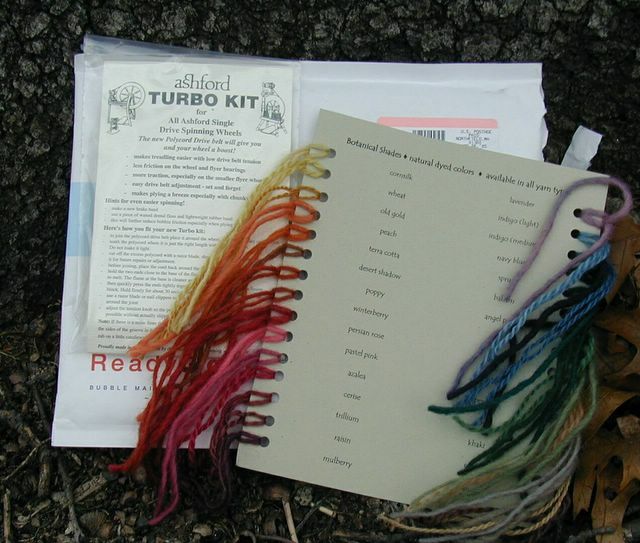 On the right is the color card for Botanical Shades yarns. These yarns are so gorgeous that I just want to hang the color card on my wall and gaze at it lovingly. At least some of their fibers come from Tregellys Fibers in western MA, and all of their yarns are hand-dyed in small batches without the use of heavy metals or other toxins. I particularly like the orange shades, which is notable as orange is not a usual favorite for me. They are very rich, like a slightly muted and heathery version of maple leaves in the fall. Unfortunately, the website for Botanical Shades is under construction so I'm not sure if they will be at any of the fiber shows this year; I plan to e-mail them to find out. I purchased this color card from Peggy at Ewe and Me Handweaving. She is great to work with and will gladly do mail order.